Tuna fish is so high in mercury that consumer reports recommends that pregnant women eat NO tunafish. Here is the article. Because of this, I don't feed it to anyone in my family, even though we all love the taste and need to eat fish. So I have found a super cool way to completely substitute tuna fish with packaged Wild Alaskan Salmon. Wild Alaskan Salmon is on the super-low mercury list and is pretty much the safest/bestest fish you can eat and serve. On its own I think the packaged salmon tatses too fishy. But I played around with it and made it taste so much like tuna fish that even my son will eat it disguised as a "tuna" melt on a bagel, and he thinks he hates salmon. 1. Put the contents of the Wild Alaskan Salmon packet in a colander and rinse it through to get rid of the fishyness, (You can find the salmon packet in the canned meat section of the grocery store). 2. Squeeze or dab the fish meat dryish with a paper towel. 3. Put it in a bowl that you can store in the fridge when you are done, and stir in mayo (your choice amount). For A.J. I use use Helmann's canola oil-based mayo, since she can't eat soy and regular mayo is soybean oil-based. The canola oil-based mayo is displayed right with the regular mayo so you don't have to search the grocery store. You can also get some canola oil-based Spectrum brand mayo in the Greenwise section of Publix. But for myself, I use regular Helmann's Mayo. It just tastes better. 4. While mixing in the mayo, really squoosh the salmonfish with the spoon. This makes the texture more smooth like tunafish. 5. I don't add salt, (the fish is already salty enough) but I do add a little garlic powder because I am a garlic fiend and also it is very good for you. 6. Stir in a a couple of drops of organic lemon juice or if you are really organized, fresh lemon juice. 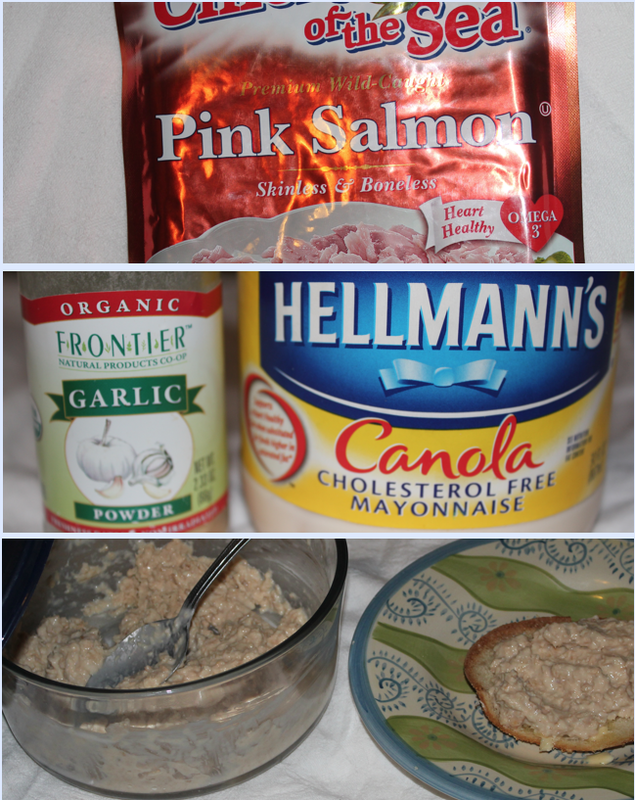 With lots of mayo, and spread on toast (GF or regular alike) , this Wild Alaskan Salmon tastes delicious. I no longer miss eating tunafish...my favorite food on the planet, because I have a great alternative. The important part it that you are eating healthy fish instead of mercury-filled fish. My personal favorite is a Tunafish Salmonfish Melt on a toasted garlic bagel. Yum. We bought some Almond Milk Original for Mia after your last post and I plan on trying the salmonfish too. Thanks for inspiring me.